Yadah is widely known for its natural skincare products that are greatly packed with a key ingredient call Opuntia Ficus extract, a unique cactus species organically grown and cultivated in Korea. This time around, they are finally getting about launching cosmetic debuting Yadah Sweet Milky Tint and Yadah Mascara! They are both now available at selected Sasa outlets, online zone such as Zalora.com.my, Hermo.my and MIVVA.com! It's inevitable to comment on Yadah's adorable packaging. They are bluntly cute, bright and colorful, very young and fresh. Everywhere you turn, you'll find Yom Yom (their mascot) trying to catch you attention. Flutter you lashes with Bloom and Highlash that create voluminous and lengthens your eyelashes. Bloom with a fushia pink cap is a jet-black volumising mascara that builds bodacious eyelashes with superior volume. It's plumps up your lashes to make it look oh-so-full. This features a special curvaceous brush with staggered bristles that provide an extremely smooth and easy application. As you can see in the picture above, the brush is rather unique, a flat-wide brush. I find myself using the sides to coat my lashes. This Highlash Mascara helps wing-out the lashes instantly. 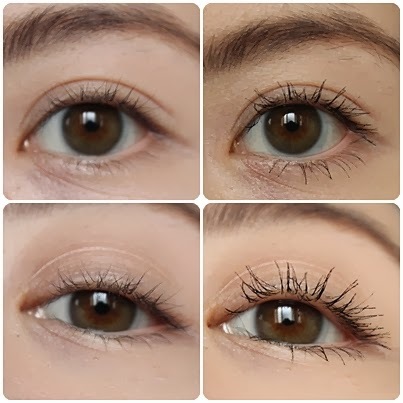 It performs well in lavishly lengthening my lashes but I will still need to curl my lashes to give it a beautiful natural curl. It separate my lashes nicely and feels super light on my lashes. 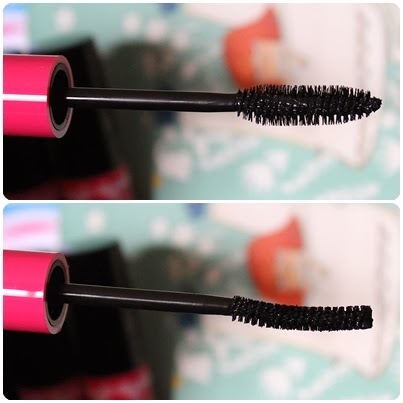 I believe if you want to, you can mix these two mascaras together to get the maximum effect. To my surprise, this also comes with the unique Opuntia Ficus botanical blend that can help nourish your lashes. Besides that, it also contains D-Panthenol to strengthen eyelashes and prevent loss of lashes. It doesn't smudge or flake on me and still easily be removed with warm water. The best part is that it's safe for sensitive eyes and contact lens wearers. Formulated Without: Paraben, Sulfate, Surfactant, Talc, Artificial Colorant and Artificial Fragrance. True Gem in a Bottle! It's formulated with semi-precious gemstones such as Amethyst, Pearl, Tourmaline, Emerald and Ruby to act as a barrier on the surface of the lips to prevent water loss, keeping lips moisturised in a subtle sheer finish. It's enriched with fruit and flower extracts such as Common Purslane, White Mulberry, Pomogranate, Gingko Nuts and Common Fig to act as natural conditioners with color pigments extracted from Tomato and Gromwell. Tints are definitely one of my favorite products due to its duo functionality and convenience. Such a versatile product should be found in every girl's bag. However, just make sure that you always blend it with a clean finger. Plus, tints usually last longer, on lips and even cheeks. They make you look like you are born with such pretty flush on your face. My favorite is 01 Sweet Cheery cause 02 Sweet Pinky is just way too light for me, it only works for my cheeks but can't see nothing on my lips. Suitable for oily and acne prone skin. It's allergy-free, non-sticky and non-greasy. Formulated Without: Paraben, Benzophenone and animal matters. did u use fake lashes?